Tabletop Christmas Tree | Easy, Fast & Festive! 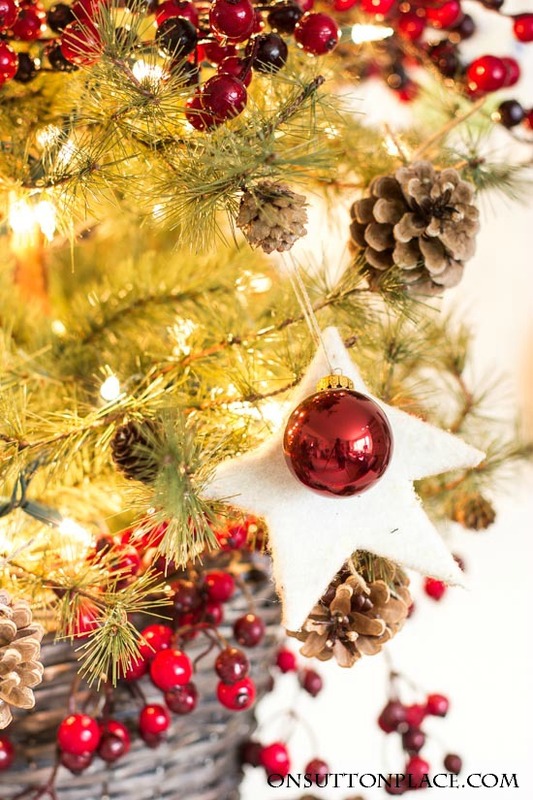 In this post: Tabletop Christmas Tree: Easy, Fast & Festive! 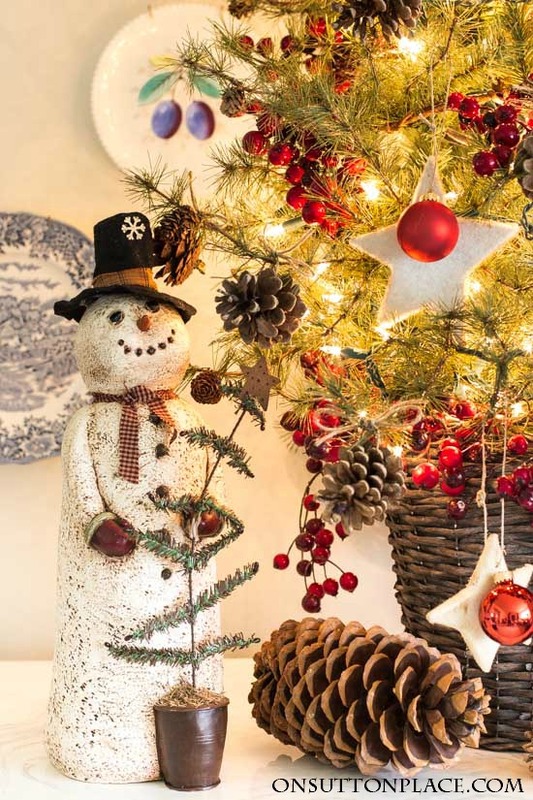 Ideas for decorating a tabletop Christmas tree with felt stars, cranberry garland & white lights. Now that Thanksgiving is behind us, and by the way I hope your day was lovely, it’s time to get on with decking our halls! 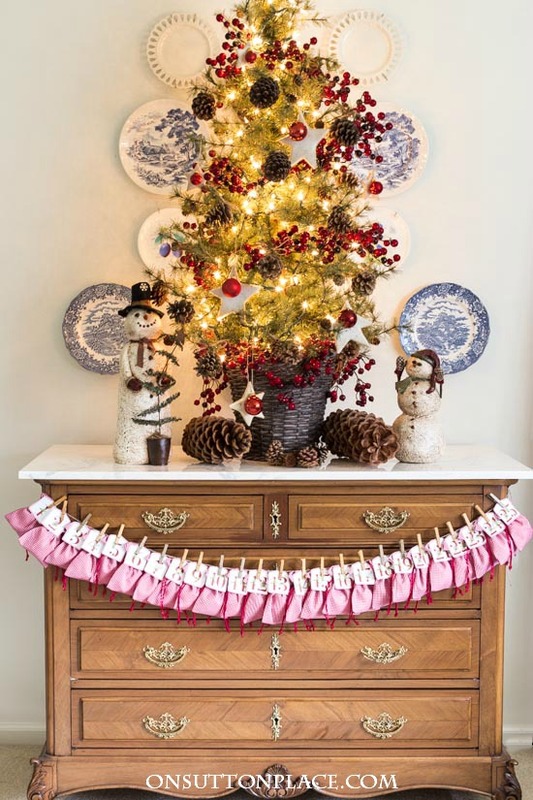 One of the best places to start is with the tree…mainly because it’s the center point, plus it can set the tone for the rest of your decorations. 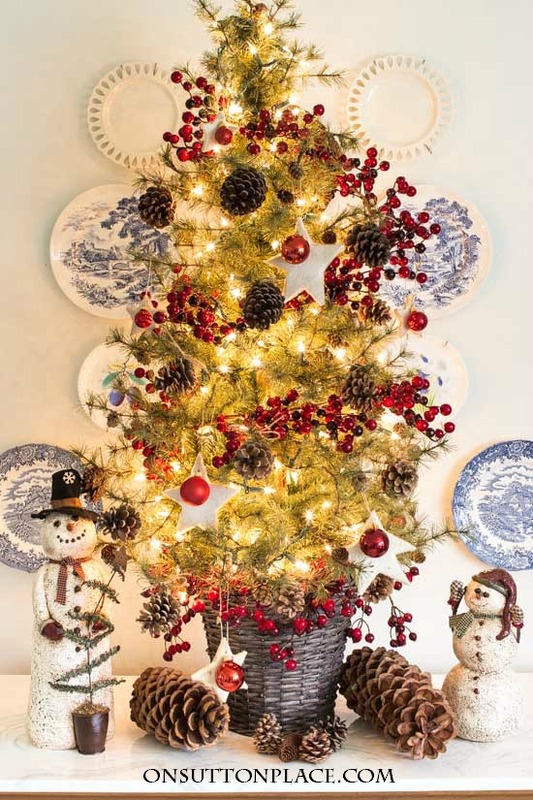 You’ve seen this tabletop Christmas tree before so that’s no surprise…but it looks different from years past and it took hardly any time at all. Note: I purchased the tree a few years ago from Balsam Hill. Click HERE to see the 2015 tree and HERE for the 2014 tree. I used things I already had but they look fresh because they’ve never been on the tree before. You saw the cranberry garland on last year’s front porch. Next I tied on some pine cones with twine. The finishing touch on the tree was the addition of my felt star ornaments strung with red balls. You first saw them a few years ago on my stairway garland. They’ve also appeared on my dining room chandelier. Since I don’t have one single present wrapped yet, I added a couple of snowmen and pine cones under the tabletop Christmas tree. The snowmen were my Mom’s…and they make me smile every time I look at them. I made a small “NOEL” banner using my Christmas Alphabet Printables. More on those at the end of the post. I love the way it looks strung across the vintage ladder. 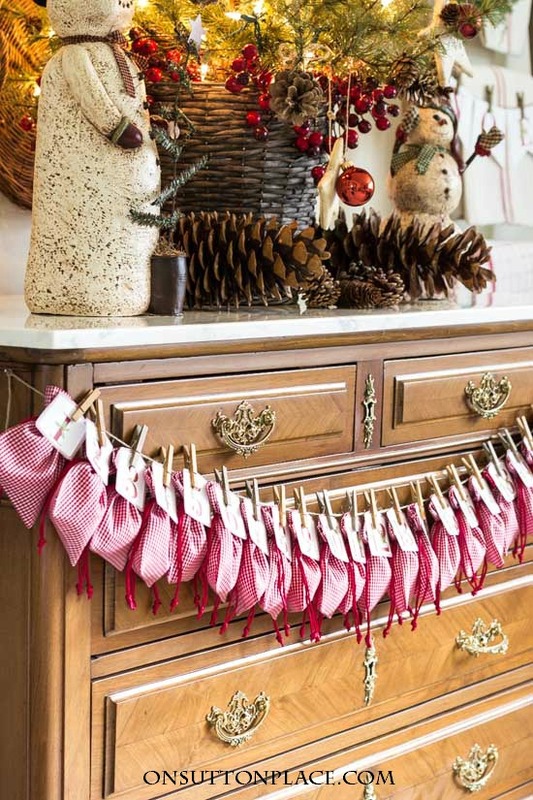 Strung across the front of the chest is an easy DIY Advent Calendar. The little red gingham bags were leftover from the Christmas packaging I used for my online shop last year. Other options would be plain muslin bags or brown kraft bags. 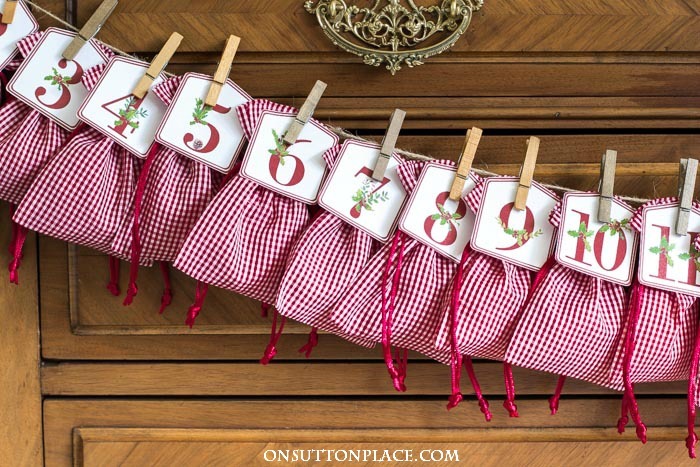 Simply print the numbers, cut them out and clip them, together with the bags, on a piece of twine with clothes pins. More on the number printables at the end of the post. For more information on the Christmas Alphabet Printables and Advent Calendar Numbers just click the red button below. 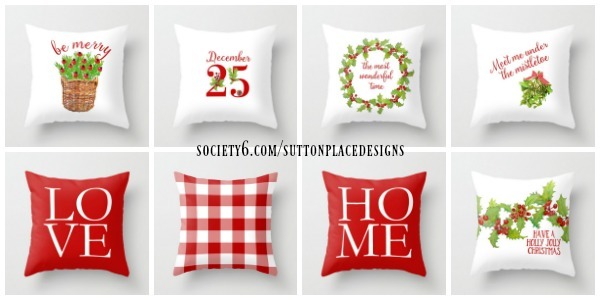 Society6 news: I’ve listed new Christmas designs for 2016 and they are available along with all my designs from last year. Click HERE to see the entire collection. All the designs are available in pillow covers, tote bags, stationery cards, home decor items, phone cases and more. Thanks for stopping by…I’ll see you on Sunday! I LOVE the advent garland. I have been saving James Avery charm bags to make an advent garland but couldn’t decide hoe to put on the numbers. I like the clip numbers and am going to make it this weekend! I just adore your mom’s snowmen, too! And those numbers on the gingham bags!!!! I only do tabletop trees now, too, and yours is spectacular! I think that if there is an award available for most creative, generous and hard working gal ’round town, you’ve earned it!!! That’s a darling little tree, Ann! And the snowmen are just precious! What a great idea the little bags are, too. Since my twin five-year-old grandsons are living with me now, I will set up a special “children’s tree” for them, which will probably be about the size of your little one in this post. I have to search among my “stuff” for some decorations, but I know they will love it. I’m going to go to some of the links you listed, especially Society6 to see what goodies there are, too! What a lovely and warm tree. I admire your style of decorating. You know how to do the prettiest designs. I hope your Thanksgiving was delicious and full of wonderful memories of your mom:). 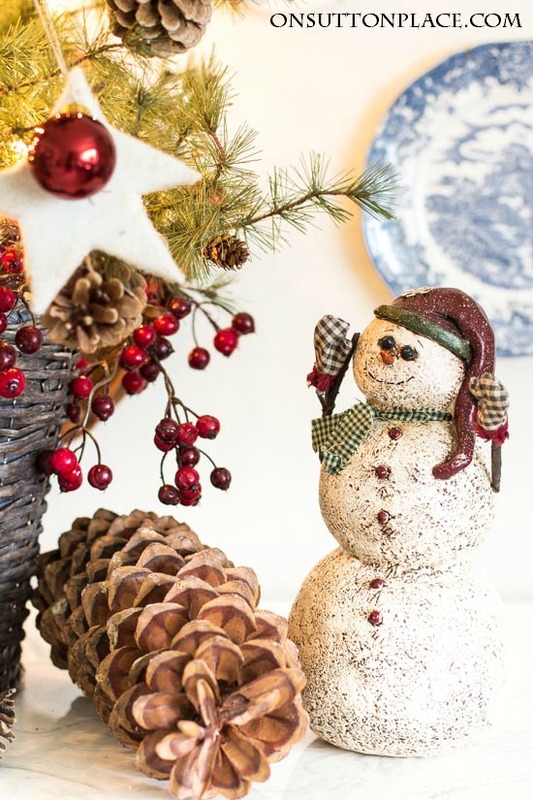 I love the snowmen, perfect for the outdoor woodsy Christmas tree. Incorporating all what you have, still makes it fresh. I love it Ann, I can see my table top tree looking like that, love bittersweet for Fall decor and cranberries for Christmas. Dang, I need to find a cranberry garland:). Your tree and snowman are too cute. Love the Christmas letters and the white star with the red ornament. Lovely little tree and i like the simplicity in which you decorated it although, i don’t believe i have ever seen an ugly tree. Hope you had a great Thanksgiving. The tree is adorable,love the snowmen. Love your little tree! 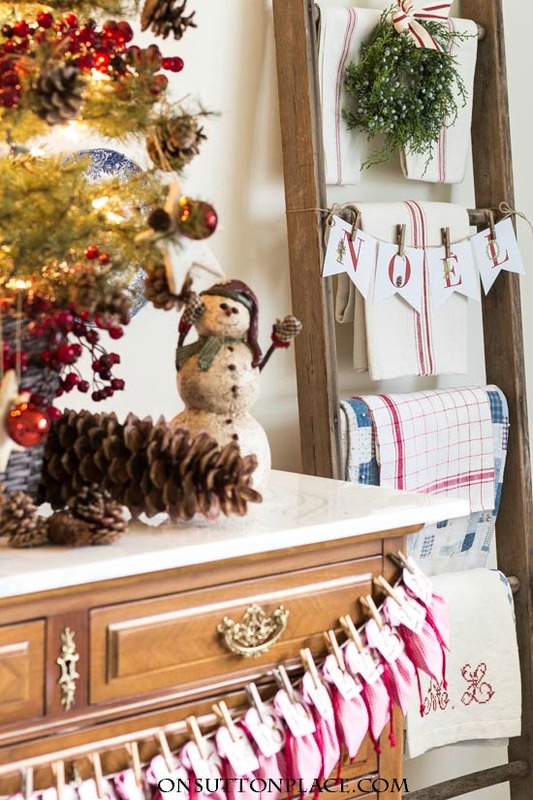 We don’t have much space and at my age, I don’t like to have to rearrange and drag things out of hiding to add some holiday sparkle. Inspires me as always…. have to be at work today but this has out me in the mood to decorate. Tomorrow I will drag out all my Christmas things and start. Hope you had a great thanksgiving. We all have so much to be thankful for. And thankful for friends like you who inspire. I love your tree and your mom’s snowmen make me smile too. Thank you for sharing. i love it! So naturalistic and fresh.